Whereas I do not contest the existence of a small, perhaps negligible, segment of Greek citizens of Vlach origin that does not subscribe to a Greek orientation or identity, I am troubled by the notion of an 'ethnic Vlach minority' in Greece. Doubtless, the statistics may be markedly different among members of the Diaspora, including the descendants of autochthonous Vlachs of Thessaly, Macedonia and the Pindus mountains who emigrated to Roumania or other parts of Europe and North America during the latter part of the 19th century and early 20th century. Clearly, these Aroumanian Vlachs did not feel Greek but rather identified with the Roumanian national awakening of the mid-19th century. 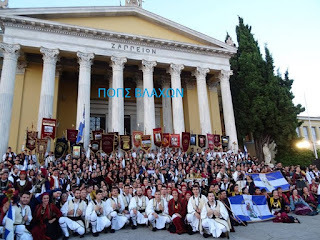 By the same token, there is also compelling evidence to indicate that the overwheling majority of Vlachs currently residing in Greece declare proudly, explicitly and resolutely their Greek identity. The long list of Vlach statesmen and politicians, clergymen, academicians, educators, and benefactors who contributed immeasurably to the building of the Modern Greek State are prime examples in this regard. Putting things in a historical context, non-Greek speaking members of the polyglot Rum Millet, living or travelling through Ottoman occupied territories of Rumelia (i.e. the Balkans), such as the Vlachs, Arvanites (Arbinesi in Vlachic), and Arvanitovlachs (Albanian Vlachs 'Karagkounhdes') constitute an inseparable part of Romiosyni and Hellenism. Let us not forget that these groups played a *prominent* role in the Greek War of Independence (1821), the Balkan wars, and *the shaping of Modern Greek identity*. As British historian Douglas Dakin asserts, a crucial factor for the Greek success during the Macedonian Struggle (in the beginning of the 20th century) rests with the fact that the Greeks were fighting in an area in which the population was favourably-disposed and even related to them. A population with a profound devotion to the Ecumenical Patriarchate and express Greek identity even though was not, for the most part, Greek-speaking. According to Asterios Koukoudis "But if we then investigate which Vlach villages and settlements were liberated and incorporated into Greece at that time, we find that not only the majority of the Vlach people, but all the ancestral Vlach villages (apart from the decadent Moschopolis (Voskopojë) and a few other exceptions, such as Gopes and Maloviste) now became an integral part of Greece." 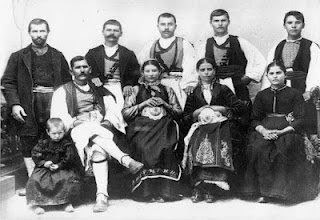 "When one examines the Vlachs shifting demographic situation, it becomes clear that after the Balkan Wars (1912?13) the vast majority of the Vlachs (two-thirds according to Weigand) became Greek citizens, in addition to their existing identity as integral members of Romiosyni, the modern Greek nation. In 1912?13, of the 160,000 or so Vlachs whom Weigand estimated to be living in the Balkans at the end of the nineteenth century, 102,330 were in Greece, 30,830 in what is now Fyrom, 13,465 in Albania, and about 10,000 in Bulgaria, Serbia, Kosovo, and Bosnia. However, Weigand ís demographic records are by no means complete or absolutely correct, like others from the same period (such as the statistics provided by the Oecumenical Patriarchate). A completely different and certainly exaggerated picture is presented by the demographic reports and population figures drawn up by pro-Romanian writers (such as Margaritis and Rubin, and Boga), in which the deliberately inflated numbers conflict sharply with both the Slav (Bulgarian and Serbian) and the official Ottoman-Turkish statistics. So if we compare the disparate demographic reports and bear in mind certain unknown or little-known statistical data, itís not hard to arrive at the firm conclusion that the Vlachs numbered at least 200,000 at the beginning of the twentieth century, and probably no more than 220,000"
Looking at excerpts from authentic Ottoman documents and statistical records one soon realizes that Greeks and Vlachs were consistently considered at least in the eyes of the Ottomans as one group. Appended below is the Statistical Information from the Ottoman yearbook of 1902 for the Bitola (Vitola) Vilaet [it should be noted that the URL http://w3.tyenet.com/kozlich/pasha.htm contains annotations from a Bulgarian perspective; according to the Bulgarians the interpretation of nationality was based on language. In contrast, the Greek definition at the time was essentially an extension of the Patriarchal definition of the "Genos" and "Romiosyni" that is, it was based solely on consciousness. The Ottoman definition in this regard would appear to be closer to real situation. That many Vlachs living in neighbouring countries view nowadays Greece as their Metropolis is perhaps best illustrated in the paradigm of the Vlachophone population residing today in Albania. There is no doubt that the historical preferences of Albanian Vlachs mirror their deep intra-communal divisions since the mid-19th century. The only difference is that today these divisions have become 'tripartite' comprising not only the traditional pro-Roumanian and pro-Greek camps, but also an amalgam of ostensibly 'undifferentiated' or 'independent' groups. Some of the latter are moderate whilst others are patently irredentist. A prime example in this regard is the 'Aromanian' nationalist movement in the tradition of Prof. Vasile Barba and the ULCA organization in Freiburg (Germany). An indication of ULCA ís orientation is the rhetoric against the Ecumenical Patriarch Vartholomaios that has appeared in recent years in the organizationís official publication Zborlu a Nostru. In this, His Holliness is described as a 'wolf' (indeed, an appalling insult that was, however, promptly denounced by moderate, albeit 'independent' Vlach members abroad). Without credible demographics or even 'opinion polls' it is impossible to assess the percentages of each constituency although historically, the evidence of an Albanian Vlach orientation toward a Greek identity is indeed staggering. From a Greek viewpoint, the affiliation of Albanian Vlachs is central to the question of Northern Epirus in light of the fact that the Vlachs constitute the predominant element of the Greek minority in present-day Albania. Rejection of a Greek identity by the Vlachs [doubtless, a wishful thinking by many] will further shrivel the critical mass of the Greek minority in southern Albania. Thus, the 'ethnic' separation of the Vlachs from Greeks is a high stake of Albanian nationalism ? the break of the Vlachs from Greek camp will effectively silence Greek 'claims' or grievances as regards to their 'perceived' sizeable minority in Albania. [A propos to the Vlach question, a similar, albeit less publicized, situation exists in the Former Yugoslav Republic of Macedonia (FYROM). The interest on the part of FYROM nationalists to assimilate the Vlachs is twofold: firstly, to extinguish any claims for a Greek minority in FYROM, and secondly, to ensure that the 'Macedonian Slavs' constitute a majority in that country. "By counting the Vlachs as Greeks, Greece ends up with a sizable minority in Albania, so the strategy of Albanian nationalists is first to pretend that the Vlachs do not exist (i.e., that they are regular ethnic Albanians). But Orthodoxy tends to make us resist assimilation in Muslim-majority Albania and opens the door to our claiming we are Greek. The Albanians would much rather we identify ourselves as anything but Greek, and so they have at times treated us as a Vlach minority, at other times as a "Romanian" population on Albanian soil. Indeed, the Albanian Vlachs can determine the direction the "Greek question" will take; if they declare themselves Greek, the Albanians have a real headache, but if they say they are Vlach or Romanian, Greek claims will be undermined. There have been many signs lately that the Vlachs of Albania are aligning themselves with the Greeks. The attractions are nearly irresistible -- almost the only way out of Albania's economic misery is to obtain a visa to work in Greece, and our people can do so simply by declaring themselves "Greek." And every time Albania strengthens its ties with the Islamic world -- an astute political move, considering Europe's abandonment of the Bosnian Muslims -- the Vlachs, Greeks, and Orthodox Albanians are brought closer together by their fear of Islam." Ultimately, the answer can only come from one source: the Vlachs themselves who, as in the past, will be called upon to delineate the direction of their national orientation (and if need be in a form of a referendum). "Even so, the most unfair and unrealistic attitude towards, and treatment of, the Vlachs comes not from these weak and declining circles abroad, but from the wariness, the frequently negative attitude, and the often tragic ignorance of Greek policy-makers, whether of Vlach or non-Vlach origin. As long as the international community regards the 'irredentists' abroad as the only source of information about Vlach-related issues, any problems that exist will be perpetuated. The [Greek] state is no less responsible for the current role of these 'irredentist circles', and ignorance doesn ít justify its attitude, especially in the eyes of the simple, ordinary Vlachs. For simple people, simple things might be enough."